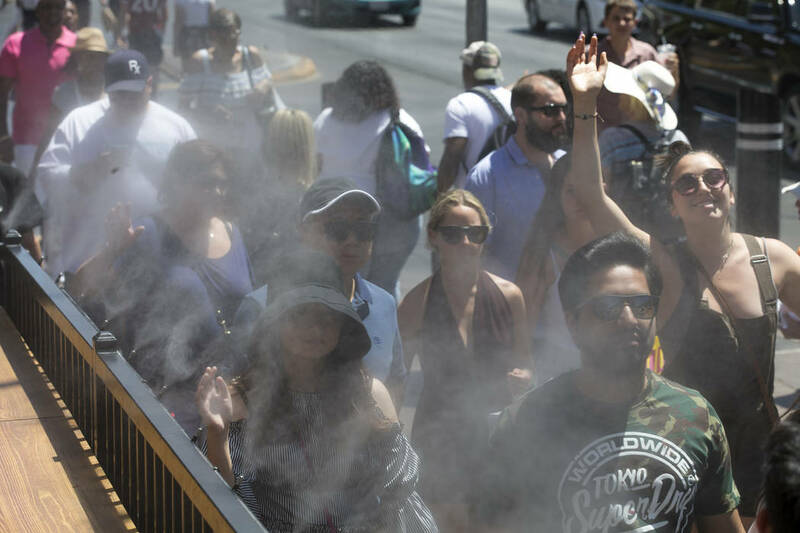 Cooler temperatures are expected in the Las Vegas Valley over the next five days, as excessive heat warning expires, the National Weather Service said. Cooler temperatures are expected in the Las Vegas Valley over the next five days, the National Weather Service said. The excessive heat warning issued Tuesday expired Saturday night, the weather service said. After Saturday’s high reached 114 degrees, Sunday’s high will drop to 108, with temperatures continuing to drop until early next week, the National Weather Service said. Rain chances will also increase slightly as the new week begins. Monday’s high is expected to reach 107, with a 20 percent chance of rain, Boothe said. Tuesday and Wednesday are expected to see a high of 106 and a 20 percent chance of rain. “We’re just getting a nice moisture push,” Boothe said. Lows are expected to stick near 87 through Wednesday. Cooling stations opened throughout Clark County during last week’s heatwave have now closed. Summer day shelters for the homeless at Catholic Charities, Shade Tree and the Salvation Army will remain open until Sept. 30.